One of the most common chord sequences in jazz laid bare for your elucidation! The chord shapes for the second example here require a certain amount of fretboard athleticism, although the concept is straightforward enough. Many of the different music styles have adopted a kind of standard chord sequence. Take the blues, for example: where would we be without the C, F, G or I IV V chord sequence? It’s a thing that has become standardised and, as such, is invaluable for anyone learning to play. If you can play over basic I IV V changes in blues, you know that you can cope with a great amount of the material you’ll be confronted with in that style. You may be tempted to think that the same cannot be said for jazz. This is a music which is renowned for its non-conformist attitude towards harmony and so surely there can’t be any kind of standardisation here? Well, the answer is both wrong and right. Jazz does resist some ‘standard’ forms and isn’t quite as easy to pin down as a blues or folk music. But, just occasionally, we come across some parallels which are beneficial to the jazz student. Rhythm Changes lesson part two. It all goes back to George Gershwin and Charlie Parker, really. For some reason, the great jazz saxophone player Charlie Parker loved to play over the changes to Gershwin’s ‘I Got Rhythm’ and he was probably solely responsible for that song entering the jazz repertoire in the way that it has. But you couldn’t play the same song several times during a set – even the slowest audience is going to notice that! 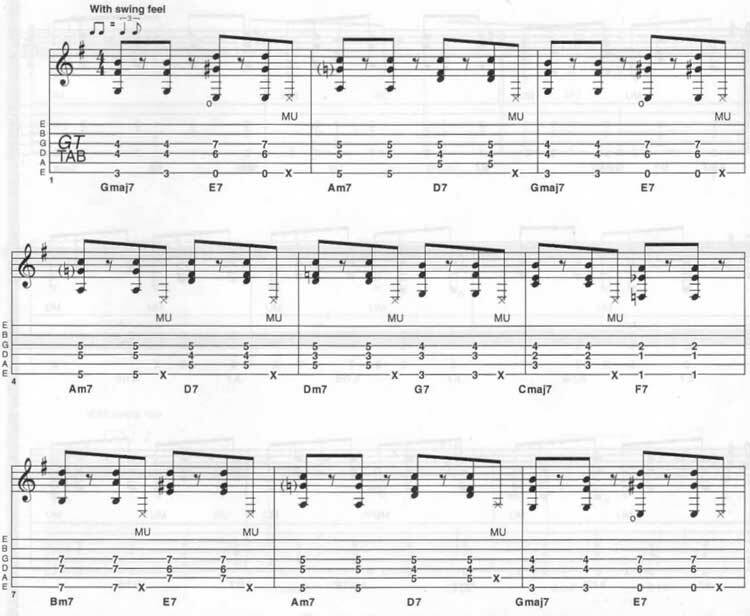 So Parker wrote a whole bundle of tunes which used the same basic chord arrangement. That way, nobody would notice and he’d get to play over his favourite set of rhythm changes several times a gig. This kind of cunning would be invisible to anything other than an audience of musicologists and so everyone was more or less happy. Today, there are still many tunes which use Gershwin’s original chord changes as their framework for different melodies, to such an extent that it makes these particular chords a very good lesson in improvisation. But first things first. This series of columns is split into three: this time we’ll be considering the basic chord framework, next time we’ll look at some ideas for soloing and finally we’ll look at one of the tunes which uses the chord sequence to support a totally original melody. And I think you’ll be surprised at which one we’ve chosen! So, straight down to basics. I’ve written out the chord arrangement in the key of G. This is a nice, straightforward, guitar-friendly key – as opposed to the original, which is in Bb. I’ve said before that Bb’s reputation as ‘the jazz key’ is based solely on the fact that it’s a really easy key for sax players to play in. It’s time for a backlash and so we’ll take the easy route, for a change! If you take a look at the first part of the chord sequence, you’ll see that the chords are pretty ‘normal’ as I’ve kept things simple here to begin with. You’ll notice that, in the chorus section, the key changes temporarily, which could trip you up initially, but you’ll get used to hearing it happen. The second set of chords are a slightly simplified version of what I’d play if I was accompanying a soloist. There is a great deal more harmonic movement there – things are more ‘interesting’ to listen to – and it forms a more demanding sequence to learn. If you play both versions, you should be able to hear the basic chord movement of the first within the more complex movement of the second. Don’t forget that the most important place to store this information is inside your head. Once it’s there, you can call upon it – but if you don’t learn it and ‘leave it on the page’ you’ll never really be able to get inside the sound of it and this will affect your ability to solo over the top. Take some time learning these rhythm changes – you’ll certainly hear a lot about rhythm changes as you progress on the instrument and knowing them in advance will stand you in very good stead when you get on the bandstand. Good luck.